The Jaiminiya Ashvamedhaparva by Maj. Gen. S.K. Sen VSM. Edited by Dr Pradip Bhattacharya. Writers Workshop, Kolkata. 2009. The first English translation from Sanskrit. 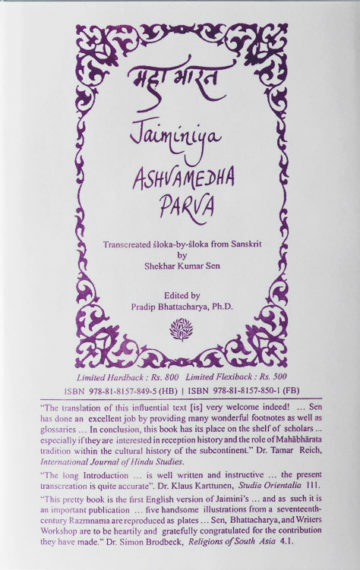 Translated shloka by shloka by Shekhar Kumar Sen, this is Jaimini’s version of The Asvamedhika Parva, in The Mahabharata. The book has 5 colour miniatures from Emperor Akbar’s commissioned translation of The Ashvamedha, a long detailed scholarly introduction and very useful glossaries of war weapons, trees and plants and other material in Jaimini’s work. “The translation of this influential text, which renders it more accessible to English speaking scholars and other interested individuals, is therefore very welcome indeed! On the whole, the translation is easy to follow and flows nicely… Sen has done an excellent job by providing many wonderful footnotes as well as two glossaries… I find the introduction to be extremely interesting and instructive. In conclusion, this book has its place on the shelf of scholars interested in the Mahābhārata, especially if they are interested in its reception history and the role of Mahābhārata tradition within the cultural history of the subcontinent.” Dr. Tamar Reich in International Journal of Hindu Studies. “The long Introduction…is well written and instructive…the present transcreation is quite accurate”. Klaus Karttunen in Studia Orientalia vol. 111. “Their pretty book is the first English version of Jaimini’s …and as such it is an important publication which can bring the text to an enormously enlarged audience…it reads nicely enough… five handsome illustrations from a seventeenth-century Razmnama are reproduced as plates…The book includes a seven-page contents list with summaries of each chapter. This is a valuable reference tool, and readers will consult it often…The book has four useful glossaries…Sen, Bhattacharya, and the Writers Workshop are to be heartily and gratefully congratulated for the contribution they have made. This book will undoubtably reinvigorate scholarly and public interest in Jaimini’s Asvamedhikaparvan.” Dr. Simon Brodbeck, Religions of South Asia 4.1 (2010).